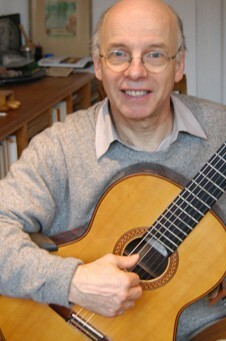 Andreas Abel, guitar teacher in Germany for more than 40 years, has always had a problem with the rough edge of the upper frame of the guitar. Especially in the summer the pressure marks can be clearly seen on the naked forearm. Besides there were sweat stains on the instrument. Colleagues also told him that an arm pad or cushion for the frame would be useful. Some guitarists suffer from the frame edge syndrome, which means that nerves in the forearm are squeezed, which may reduce the suppleness of their fingers. For guitarists this is a serious restriction of their guitar playing. As he did not find any convincing solutions on the market, he developed his own device: the Abel-Armrest, which can be easily attached to the instrument. It is produced in an extremely complex injection moulding procedure and made of PP reinforced with glass-fibre. It is very light; it only weighs 93 Gramm. A device made of wood would be heavier and might be damaged when dropped. It can be attached to guitars with a rib ranging between 8 and 12 centimetres* and removed without leaving any marks. The positive comments of guitarists and the good test reports ** speak for themselves. Thanks to an easily operated adjustment screw it can be quickly attached to the guitar and removed again (no suction cups which might slip, no gluing and no screwing connection with the guitar required). 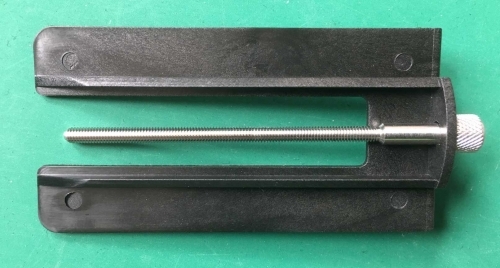 Adjustable for guitars with a rib ranging between 3,15 and 4,72 inch / 8 and 12 centimetres (also from 1,18 to 5,12 inch / 4 to 13 cm on special request). The special surface means that there is no more problem for playing with bare arms in the summer. Individual adjustment to the curve of the rib is easily possible. 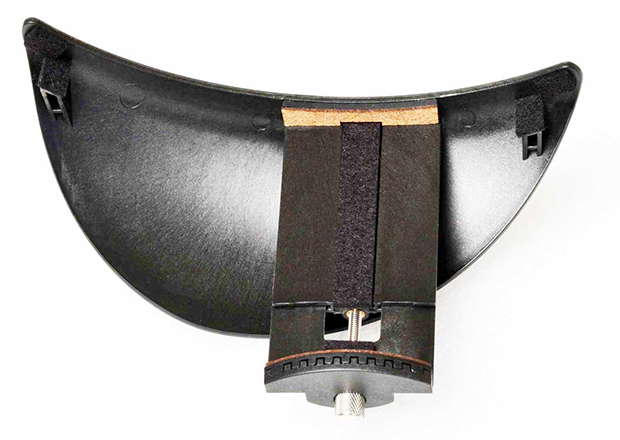 Felt pads protect the instrument. The attachment only holds on to the upper and lower edges of the rib and can be removed without leaving any marks. The soundboard can resonate freely and the instrument’s sound is not affected, but even improved. 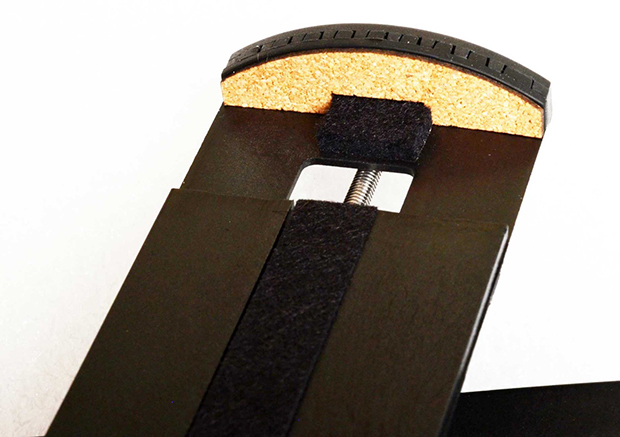 The armrest can be stored in the guitar case under the head of the guitar. The armrest weighs only 0,2 lb / 93 grammes. * On request the armrest can be produced for frames that are narrower than 1.18 inch / 4 cm or wider than 5.12 inches / 13 cm. One common range from 4 cm to 13 cm is unfortunately not possible. Brand New: Improvement with felt and cork. 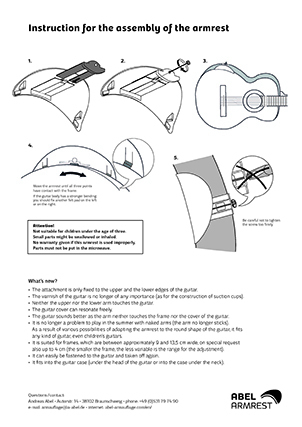 We have collected all the details for the construction and fixing of the Abel-armrest to your guitar in the directions. For the shipping, these directions have been added to each Abel-armrest, you can, however, also download it here as a PDF file. Of course, we are pleased to answer all further questions about the Abel-armrest via our e-mail form.